I don't know when I'm going to finish that story I was writing. I feel like I should even though I'm not sure it was going anywhere. Maybe someone out there (Rozie) would like to finish it for me. What happened to the fire guy? all that jazz. 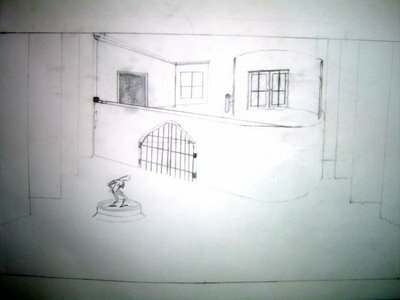 The last few days I've been working on a set design for Romeo and Juliet which I'm directing in Aug.-Sept. at school. The show is already cast and we begin on August 7. So if any cast members are reading this, 3 o'clock in my room, kay? Floor plan: I'm limited to some extent because I can't build anything stationary below the act curtain because the school has an open house in the auditorium early in the year with the orchestra needing to be onstage. They don't want to see my set. (Yeah, like it would just offend the eyes of the parents, or something.) Anyway, the big round thing to the right rotates so that Juliet has her balcony and then it turns around to reveal her bedroom. 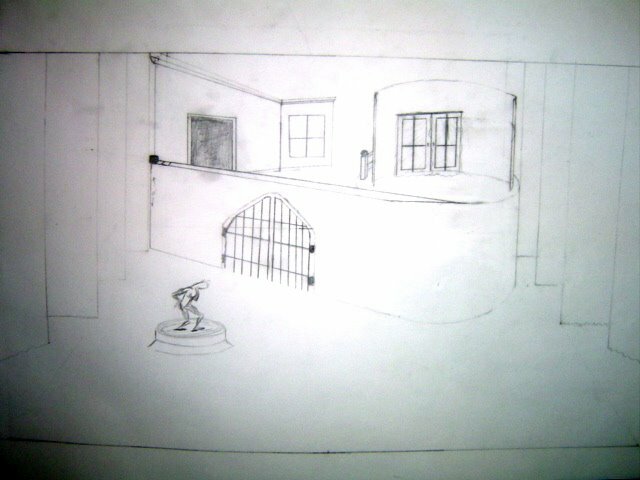 This is the first drawing I did of what the front should look like. The round balcony on the right is too big and there are some other issues with the back wall, but this is basically what it will look like. I've also been thinking that I might have the whole left wall swing in using the rotating platforms fulcrum. 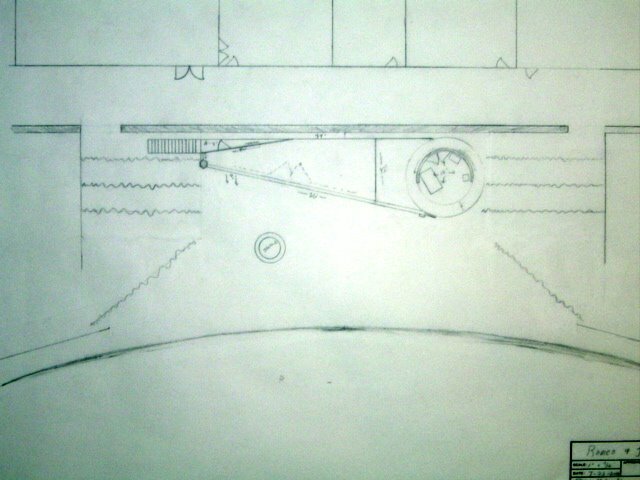 This is a more to scale drawing, although it's obviously not as fleshed out. I eventually plan to get this one colored and such. Alright! Doing the good ol', tried and true, high school Shakespeare. I like your set design. What is the round platform downstage of the main part of the set? 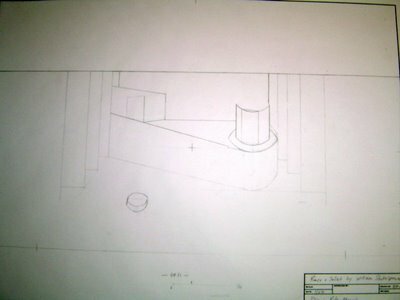 It looks like a small podium, but one drawing has a figure on it. Is it a "Veronian" statue? SO how is it designing a set for the Sterling HS stage. Is it my imagination, or did I hear that the district was going to renovate the auditorium and stage? When I was there, that was the absolute worst stage to design for and play on because it was VERY wide, with no fly space and no enough room in the wings. I think it was originally designed more for "assemblies" and such, rather than theatrical performances. Is that still this case? Oh, it just occurred to me that we will actually be around when your show goes up! Kari and I (sans kids) will actually be able to see it. What are the public performance dates? I'm assuming you'll be performing for all of the 9th-grade English classes. This will be the first Kyle Martin production that I have seen since I was in your production of "The Tempest" for your advanced directing class in college. Break a leg! No, you should keep doing your story. Yours has the ever marketable misunderstood superhero theme, and it will undoubtedly do better than my story about the girl who everybody hates because they think she started the fire on purpose... but she didn't. She DIDN'T, I tell you. Jason, the show will go up in late Sept. The exact dates allude me right now. Yes, the stage is still horrible. We did some refurbishing, though I would hardly call it a renovation. The most exciting thing has been the new light system. It's pretty cutting edge state of the art stuff. The stage itself is way too huge and of course, no fly space or wing space, but it's no worse than Sewell, and in a lot of ways much better. The only bad thing is that the school won't let me paint the floor (which looks hideous as it is), but I just bought a ton of masonite which is a semi-permenate floor covering that I can paint and do whatever on. So that helps because then I can cover the ugly floor and paint it whatever I want. Ro, Okay, I'll have to get on that story sometime this week. Don't let this keep you from writing your own, however. I'm intrigued already. Part 4: This one is called "Flashing...Eyes!" Snoop Took Over Ya Blizog, Cracka!